Lower East Side Jewish Conservancy – Kling & Niman Family Visitor Center at 400 Grand Street, New York, NY 10002. Opening of the exhibition will take place on October 30, 1-3pm during the Art & Architecture Fest, organized by the Lower East Side Jewish Conservancy. 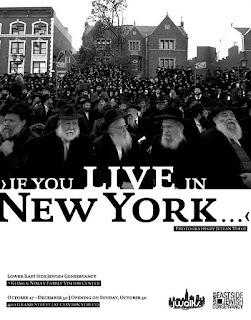 Comedian Lenny Bruce once stated that “if you live in New York… you are Jewish.” Using this reference in the title of his latest exhibition, photographer Julian Voloj explores the diversity of New York’s Jewish communities. From Hasidic Jews in Brooklyn and their struggle between tradition and modernity, to African Americans who adopted Jewish rituals to cope with the legacy of slavery, Voloj’s photographs illustrate the wide scope of Judaism in New York City. Through his photographs, Voloj creates an intimate portrait of an identity as diverse as the city itself. The core of this exhibition is a series of portraits of Jewish New Yorkers. These portraits are very different, clever arrangements that include well-known personalities such as former mayor Ed Koch or orthodox Rap artist Y-Love, but also lesser known people like a Soviet World War II veteran in Brighton Beach, or a former gang leader from the South Bronx who is a descendent of Crypto-Jews. Voloj’s photographs will be shown at the Lower East Side Jewish Conservancy – Kling & Niman Family Visitor Center at 400 Grand Street from October 27 to December 30. The official opening of the exhibition will take place on October 30, 1-3pm during the Art & Architecture Fest, organized by the Lower East Side Jewish Conservancy.